Hi everybody, it's Virginie from Jazz Couture and I'm excited to be part of the great Fabricistas team! Here in eastern Canada, so far spring has brought us a cocktail of cold, wind and rain and it's not time yet for skirts and dresses. 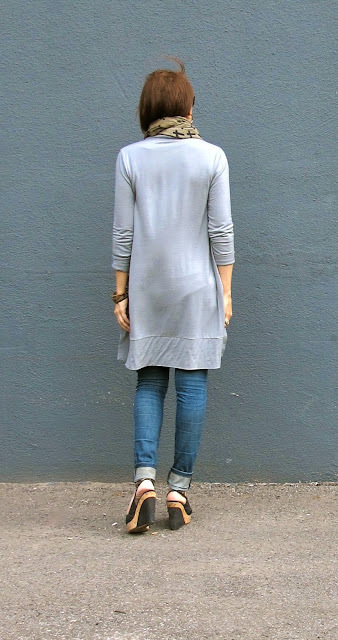 What I need now is transitional pieces, so for my first make as a Fabricista I opted for a cardigan and tried Helen's Closet Blackwood cardigan. Many sewists have made it since its release in spring 2017, and they definitely wetted my appetite for this pattern as there are many lovely versions of it on the internet! The fabric I selected for this cardi is a wonderful wool/bamboo/lycra jersey, it's a lightweight, fine gauge knit that was just perfect for what I had in mind, i.e. a layering spring piece that is not too heavy but provides a little extra warmth on chilly days (and boy did we have a lot of those lately!). The colour is called 'Stormy Seas' and it's still available here! It's a kind of gray with sage green undertones, a soft, flattering colour that goes with just about anything! Fabric Mart also has black and some grays available. That jersey knit is very refined and drapes beautifully. It's also very comfortable and not scratchy at all. This was my first time using a Helen's Closet pattern, and I selected a size small based on my measurements. The fit is slim and it's just what I expected/wanted. I elongated the bottom by 1 6/8''; it's not much but I think it makes the difference. As is, the proportions would have been sort of in between for my silhouette. I didn't use the cuffs for this version and instead turned a 1'' hem and finished the sleeve on the coverstitch. The sleeves are still plenty long and go beyond my wrist. I might use the cuff another time for a wintery version. I rectified the shoulder seam as the angle was a bit weird (too forward next to the neck, and too backward at the shoulder tip). I didn't do the pocket in two pieces as per the pattern and drafted my own pocket piece. Since I own a coverstitch, I turned a 1 1/2'' hem and finished it on the coverstitch for a RTW look. Which brings me to a tip I want to share with you. Patch pockets can be tricky with jersey knit material, as if you don't do anything the seams will often (if not always) come out wavy. That tip is something I've come up with after some experiments to solve the wavy seams problem, and you might want to try it. Personally I don't fear patch pockets anymore in jersey knits, even with the most lightweight ones! What I do is I make strips of featherweight interfacing, roughly the size of the seam allowances of the pocket (in this case 1 cm - 3/8''). I position them on the inside of the pocket and make sure to cover the seam allowance plus a little bit more. Then I simply press the seams and topstitch on the sewing machine, preferably with a short stitch and fine matching thread if the fabric is lightweight. In this case what I had on hand is just regular serging thread, but still the result is perfectly fine. Look, no wavy seams! I would also recommend that you make a test of a seam going across the grainline on fabric scraps and play with the differential feed on your serger, prior to assemble the bottom band to the bodice of the cardi. Often the fabric reacts differently when you sew it across the grain (than on the grain). I slightly decreased the differential feed on my serger to sew that seam and got a pretty even horizontal seam. Also, don't stretch the fabric when you feed it thru the serger! I think the wind made the two layers of the bottom band shift - usually I don't see those ripples! 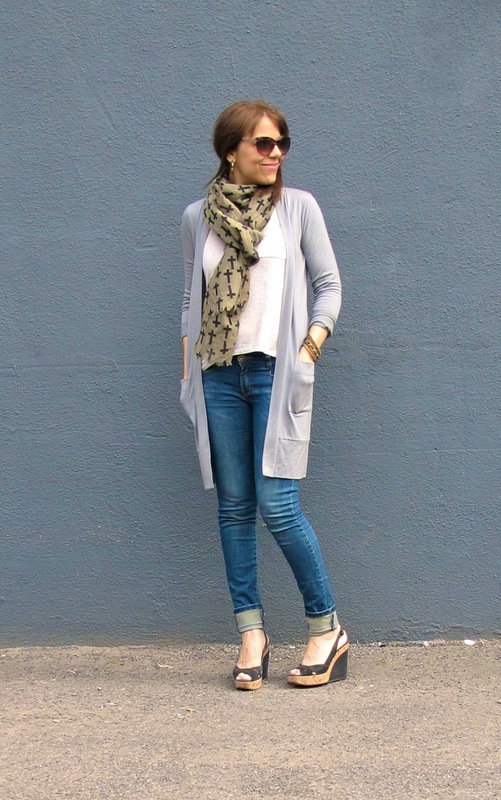 I love my Blackwood cardigan; it's a casual layering piece and I know I'll be wearing it a lot this spring! The combination of wool and bamboo makes this jersey knit very soft and a pleasure to sew and wear. I'll be seeing you again for another post in June - hopefully with a summery make! :-) Bye for now, and let me know if my little tip was useful to you! Great tip re knit pockets! Thank you! I was just curious about why you wouldn't interface the whole pocket? Is it because it would make it too heavy? I often use a fusible knit tape by pellon to tape all the seams if the fabric is very drapey (like bamboo can be!) but especially across the shoulder seams. Love your blackwood and that fabric from FabricMart is beautiful! Kathleen, I don't think interfacing the whole pocket would make it too heavy, but it would certainly stiffen it and I prefer the look of a soft pocket. 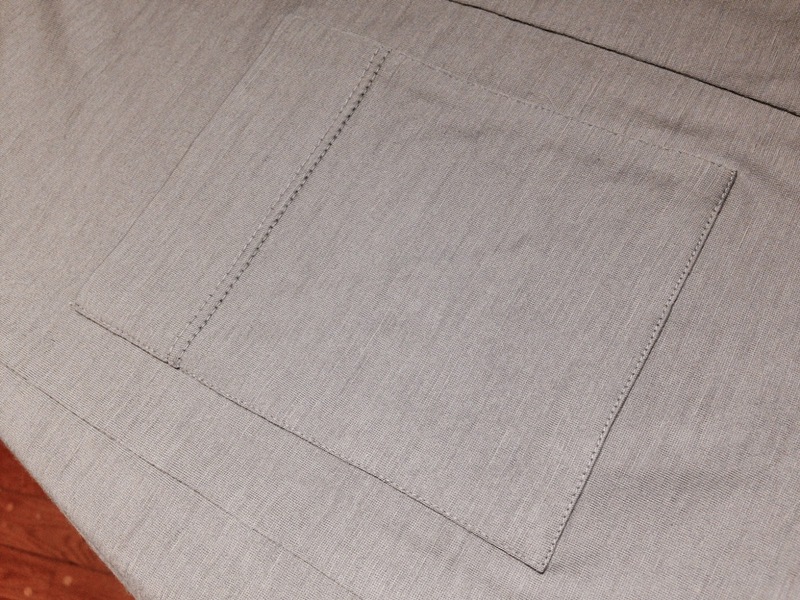 Interfacing only the seam allowance does the job, plus the interfacing doesn't show on the outside. Yes, that fabric is gorgeous and I highly recommend it! Love your cardigan. Thanks for your tips also. A very well made cardy! This is really beautiful and so well made. That sweater could be in an upscale boutique. I'm envious!! Thank you Nancy! You could easily replicate it: Blackwood cardigan pattern + Stormy Seas wool/bamboo knit = your own cardi! :-) ...and it's an easy pattern to sew. What a beautiful pocket and such an elegant cardigan!